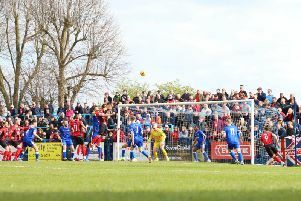 Kettering Town maintained their push for the Evo-Stik League South Premier Division Central title with a 4-1 victory at Redditch United. The Poppies opened the scoring on 14 minutes when Lindon Meikle, who was the last-gasp hero last weekend, produced a great run and fired the ball across home goalkeeper Reece Francis and into the bottom corner. And the lead was doubled just past the half-hour when another mazy run, this time from Rhys Hoenes, ended with him firing the ball under Francis. Aaron O’Connor saw a shot come back off the crossbar early in the second half before Redditch pulled one back when Danico Johnson found some space in the area and fired into the roof of the net. The Poppies had to withstand a bit of pressure after that but the two-goal lead was restored with 19 minutes to go when a ball forward from Craig Stanley was collected by Dan Holman who turned his marker and scored with a shot across goal. And another win, Kettering’s 21st of the league season, was wrapped up in the final minute when Holman released Hoenes who ran clear and slotted past Francis. With second-placed Stourbridge also winning, it means the Poppies remain five points clear at the top with two games in hand. Corby Town’s title hopes in the Evo-Stik League South Division One Central suffered a setback as they went down to a surprise 2-1 defeat to Dunstable Town at Steel Park. Things were looking good for the Steelmen when Connor Kennedy applied the finishing touch to a free-kick after 23 minutes. But the visitors levelled nine minutes before half-time when Daniel Trif took aim from 30 yards and fired his shot into the far corner. Elliot Sandy saw a diving header go narrowly wide in the second half but Corby were stunned when Chris Wreh curled a shot into the corner to give Dunstable the lead. The Steelmen piled on the pressure late on and were denied a late leveller when goalkeeper Dan George, who was forward for a set-piece, looked to have scored, only for the referee to cut the celebrations short. The defeat means Corby are now eight points behind leaders Peterborough Sports and seven adrift of second-placed Bromsgrove Sporting after they both picked up victories.